Civil War Photos Tintype Memorabilia Collectibles For Sale. 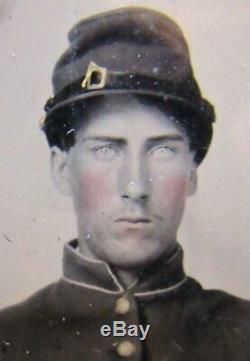 Civil War Soldier Tintype Photo Cased. With Weapon - Colt M1849 Revolver. 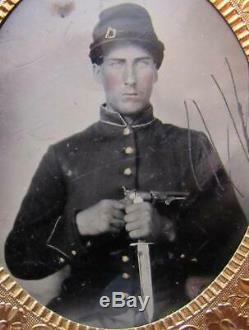 Fantastic Original Ambrotype Civil War photo of very Handsome Soldier in solider dress uniform, with M1849 Colt revolver and large Bowie knife as shown. Extraordinary detail of soldier's dress uniform and particularly amazing detail on the Colt revolver and Bowie knife. With just some minor scratches primarily in the blank area not affecting the image. That said it is particularly nice with great contrast and clarity and bright (many or most are dark). 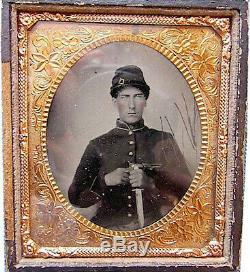 Offered is an original Civil War period 1/6-plate tintype in half case of a Yankee soldier armed with a M1849 Colt's revolver and and large Bowie knife as shown. Image has scratches as shown, mostly out of the field of interest. 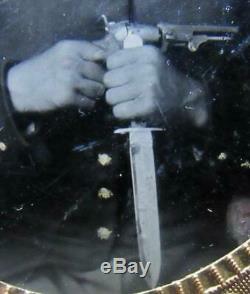 Soldier's image is sharp, detailed and clear - has GREAT detail of the knife and revolver. 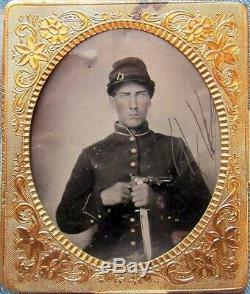 The item "Civil War Soldier Photo Ambrotype Memorabilia withColt Revolver" is in sale since Sunday, March 10, 2019. This item is in the category "Collectibles\Militaria\Civil War (1861-65)\Original Period Items\Photographs". The seller is "cvtreasures1" and is located in Saint Augustine, Florida. This item can be shipped to United States, Canada, United Kingdom, Denmark, Romania, Slovakia, Bulgaria, Czech republic, Finland, Hungary, Latvia, Lithuania, Malta, Estonia, Australia, Greece, Portugal, Cyprus, Slovenia, Japan, China, Sweden, South Korea, Indonesia, Taiwan, South africa, Thailand, Belgium, France, Hong Kong, Ireland, Netherlands, Poland, Spain, Italy, Germany, Austria, Bahamas, Israel, Mexico, New Zealand, Singapore, Switzerland, Norway, Saudi arabia, United arab emirates, Qatar, Kuwait, Bahrain, Croatia, Malaysia, Brazil, Chile, Colombia, Costa rica, Panama, Trinidad and tobago, Guatemala, Honduras, Jamaica, Viet nam, Uruguay.